I was so excited about visiting Ayuthaya, because that would mean that i will have completed 2/3 of the ancient ruin cities in Thailand. Prior this trip, I did pretty much homework to decide whether to take a train, cruise or minivan from Bangkok to the ancient city of Ayutthaya. Transport is really convenient in Thailand, though there may not be sufficient information online for us to know how. To begin with, my flight arrival time is midnight, so i had a night stay near Don Muang Airport, nevermind the location, because it was cheap, comfortable and within walkable distance of the terminals. All i need is a 711 and a couple of street vendors to deal with my midnight hunger pangs. *Tesco Express nearby was a bonus! The magic of Thailand’s 711 is its ability to satisfy our need for retail therapy even in the wee hours. Drying salted fish on the streets, wanna try some? The van station taking you to Ayuthaya is located across the highway, one will need to cross the pedestrian bridge to reach the place. Do not be confused with the van terminal beside the shopping mall. The Van station looks like the picture above. Cost: Less than 100baht/pax, you would have to wait for the van to be filled up before the driver is willing to leave. City Municipality Building, where your minivan will drop you off. This hotel is recommended for no-frills stay, as the rooms are clean and inexpensive. It’s safe and beautifully quiet. The downside is that the lobby is huge & stuffy, not very conducive for tourist waiting to check in or coming back from their visits. This hotel is strategically located within walking distance from the minivan drop off point (municipal building), bicycle rental shop and many more. Visiting the UNESCO sites of Buddhist temples, monasteries, and statues is definitely a must when you are in Ayuthaya. But one should really spare some time to explore the other parts of this ancient city. Located diagonally across the minivan drop off point is the Chao Phrom Market. 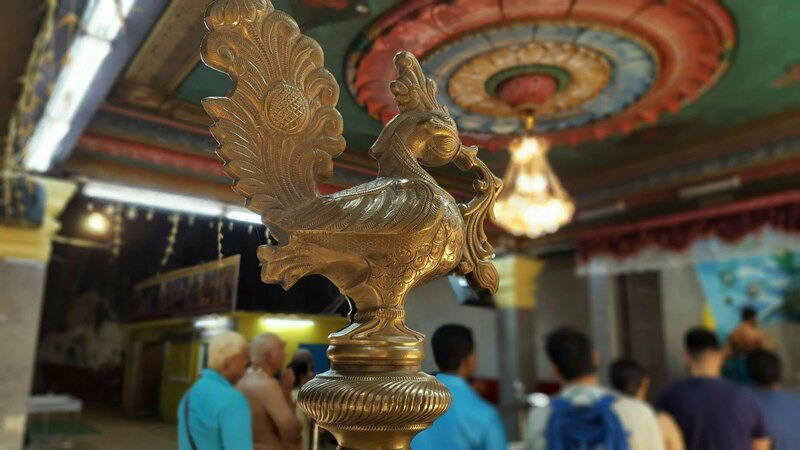 Here you can get your lunch or check in to the hotels nearby to freshen up before starting your temple visits. Chao Phrom Market is Ayutthaya fresh market, opened 7am-5pm, daily. Its good to come here and experience the sight and smell. There is an abundance of cooked food, raw seafood and meats, more fruit and vegetables than you can imagine, and other captivating snacks. Food vendor delivering or collecting bowls back from customers. The market is open throughout the day, but also depending on individual vendors. Check out the Thai-Chinese shop selling old school tidbits and household stuff. Depending on your desired time to spend here, It is still good to rent some form of transport to explore all the sites. One may hire a tuktuk driver to bring you to all the Temples. But if you are like me who is only interested in one or two temple, a bicycle would be sufficient to bring you from Ayuthaya Municipal Building > Wat Mahathat Compound > Bang Lan rd (Night Market) > Naresuan rd. A proper visit will take entire day, while a visit to a couple of sites takes 3-4hrs. Maps are available in most touristy places, you should be able to find them at your hotel lobbies, or bicycle rental shops. Admission Fees. There is a fee of 50 Baht (1.30 USD) to enter the grounds of Wat Ratchaburana. The temple is open from 8:30 am to 5:00 pm every day. Monies collected are use to fund the maintenance and preservation of these sites. The UNESCO historic site of Wat Ratchaburana aka Monastery of the Royal Repairs is situated on the corner of Chikun road and Naresuan Road, directly opposite Wat Mahathat in the vicinity. There is a two level crypt inside the prang tower, you can reach there via a narrow (REALLY NARROW) and steep staircase. It is warm and stuffy inside, really not recommended for those who are claustrophobic. Ancient murals i assume to be depicting Buddhist Stories? Just next door of Wat Ratchaburana is Wat Mahatat, a must visit site of Ayutthaya. One of the most photographed Buddha around the world is the Renown for the stone Buddha head entwined within the roots base of a tree. Check out my upcoming Thai-mazing journey! The hotel is located at the rear entrance of ximending & 5mins walk from ximen station. Looking forward to visit the ruins in Ayuthaya too! Credits: pictures were taken from google map. 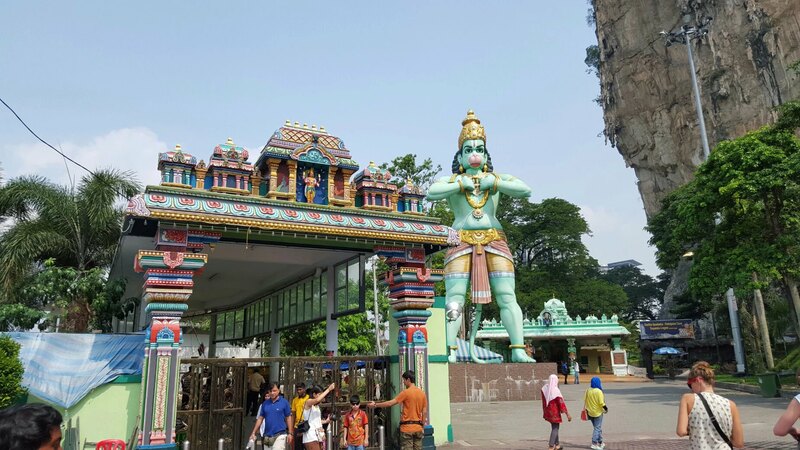 Besides the good food and shopping, Batu Caves is another must visit attraction when visiting Kuala Lumpur (13 kilometres north of the city). 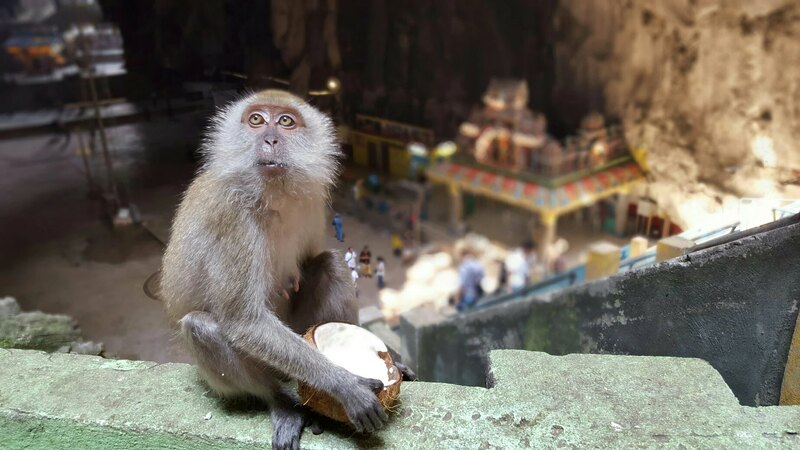 The Batu Caves is the most widely known Hindu Temple in Malaysia (almost like a local icon), dedicated to Lord Murugan and at every Thaipusam (which falls in late January/early February), it will be crowded with Hindu devotees carrying Kavadi and milkpots to express their devotion. 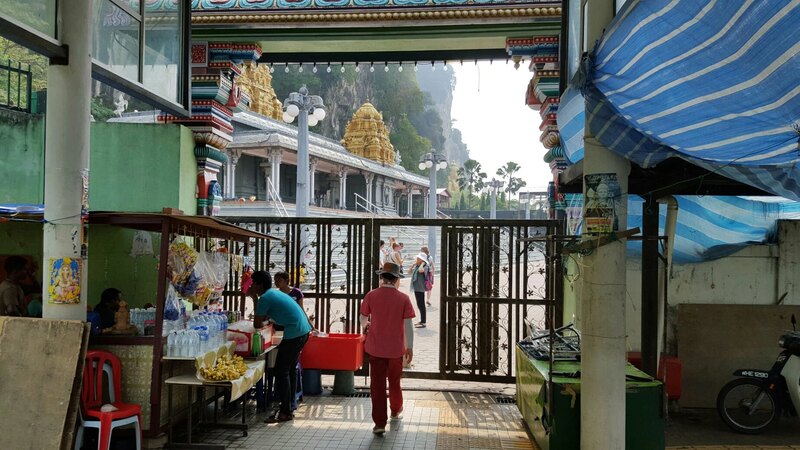 The Batu Cave Temple is also known as 10th Caves or Hill for Lord Murugan as there are six important holy shrines in India and four more in Malaysia. 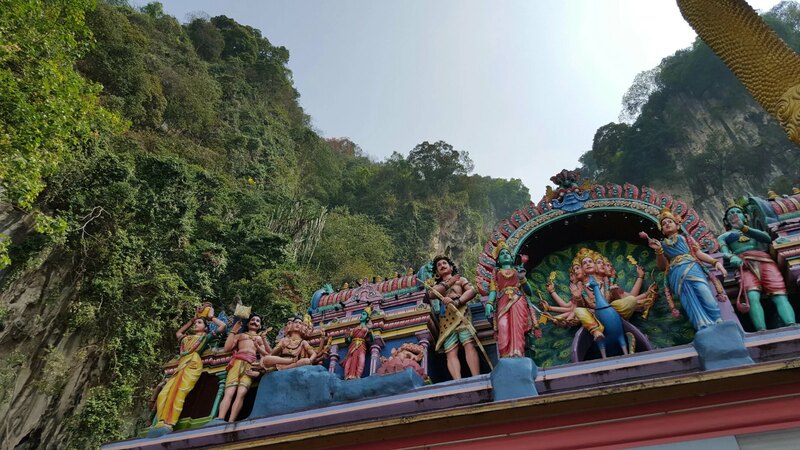 The three others in Malaysia are Kallumalai Temple in Ipoh, Tanneermalai Temple in Penang and Sannasimalai Temple in Malacca. 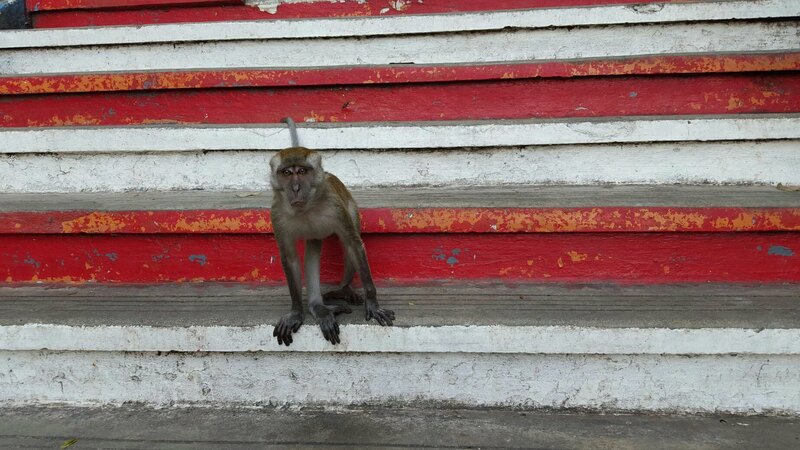 Lord Hanuman: Welcome to Batu Caves! 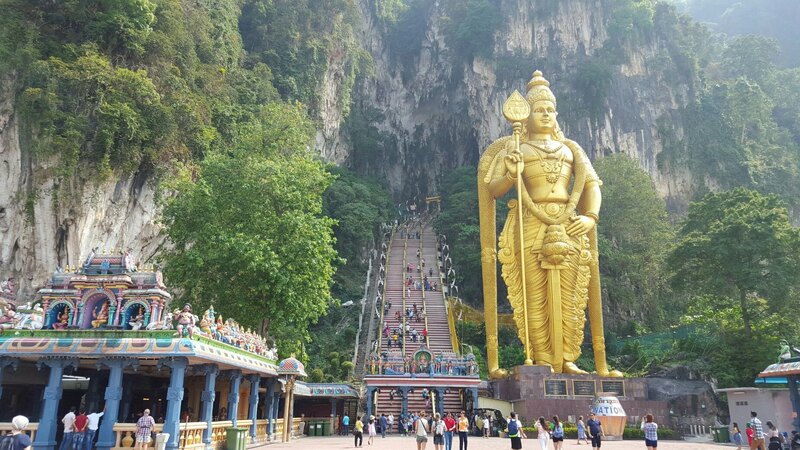 The Batu Caves temple complex consists of three main caves ..
One of the most iconic feature of Batu Caves has to be the 42.7-metre high statue of Lord Murugan (tallest Lord Murugan statue in the world). The statue, which cost approximately 24 million rupees, is made of 1550 cubic metres of concrete, 250 tonnes of steel bars and 300 litres of gold paint brought in from Thailand. This area is a limestone hill comprising three major caves and a number of smaller ones. 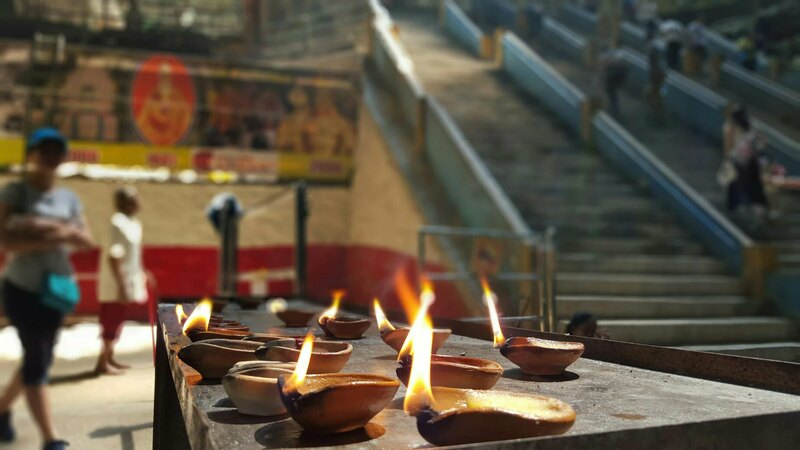 The limestone formations found in the caves are said to be around 400 million years old, the temple is considered an important religious landmark by Hindus. 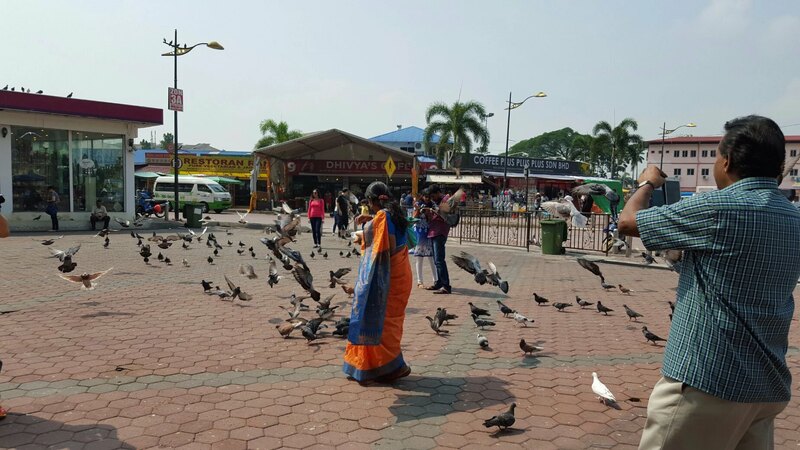 There are many stalls there selling religious artifacts, food for feeding birds, drinks, indian vegetarian restaurants. So don’t worry if you’ll get thirsty or hungry there. Be prepare to burn your leggy fats, pay extra caution as the steps are rather steep. You are welcome to observe the worship session, just kindly remove your footwear before entering the temple sanctuary. Note: do not disturb the sanctity by taking photos with your flashlight on. All i can say is.. you need to put effort if you want to achieve something. The view here is worth every step i took. 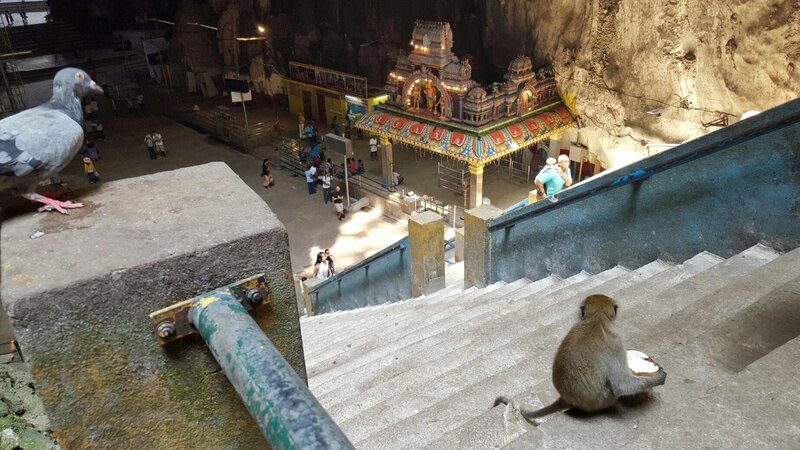 Lots of monkeys and pigeons around..
As you climb up the 272 steps towards the Temple Cave, you will find a path branches off to the Dark Cave. Follow the path and in no time you will feel the cool breeze coming out of the cave entrance. There are registration tables where visitors can sign up for the tour. You will also find a mini-exhibition of the bats you can find the Dark Cave. You will most likely be able to only hear the bats flying around in the cave due to the darkness so this is the best time to see what those bats would look like upclose. The Dark Cave is where visitors can explore the enthralling cave ecosystem with a guided educational tour. 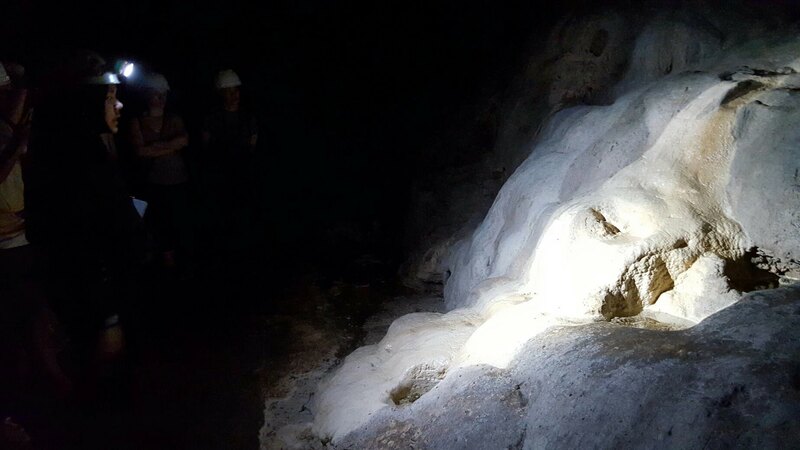 The Dark cave is at least 100 million years old and the limestone that surrounds it was originally formed from shells and coral, from when this entire area was underwater. The cave is also home to millions of both fruit- and insect-eating bats where their droppings (also known as guano) supports an ecosystem within the cave, with cockroaches, spiders, crickets, snakes and other creepy crawlies living off either the guano, the bats themselves or each other. 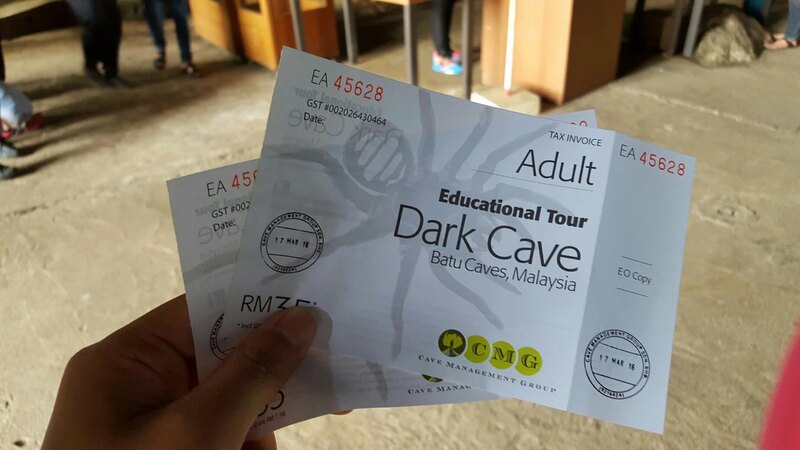 For RM 35 (Adult), you can sign up for the Dark Cave Educational Tour – Just come in your comfortable shoes and clothing and keep yourself hydrated as the tour is about 45 minutes long and the cave can get quite hot at times (with temperature of 27º -29º Celsius and 85-90% humidity year round). Torchlight and helmet will be provided. 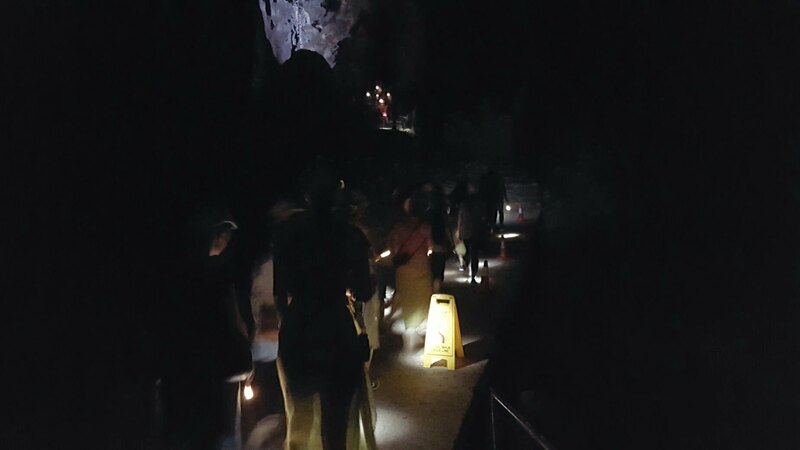 Do note that the Dark Cave tour is not available on Mondays; the tour is available from Tuesday to Friday 10am to 5pm and on Saturdays, Sundays, Public Holidays 10.30am to 5.30pm. Coming By Train. 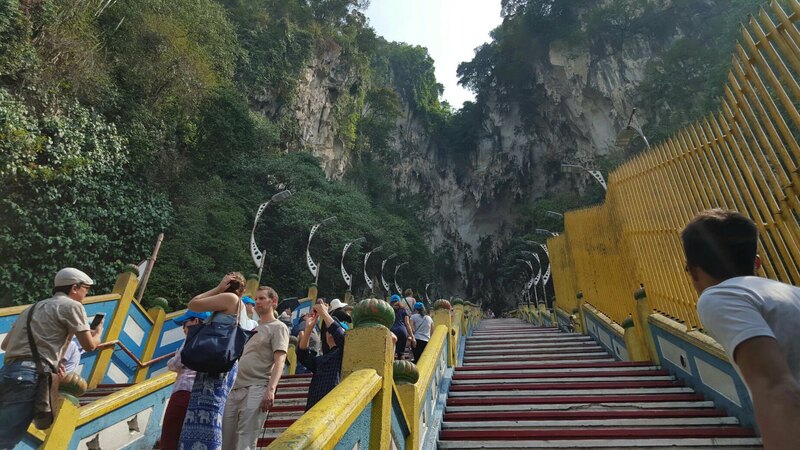 KTM Komuter train takes you to the caves on the Batu Caves – Port Klang line. An adult single fare is RM2.00 from KL Sentral to Batu Caves. The journey from KL Sentral to Batu Caves takes about 30 minutes and trains run on a frequency of 15 to 30 minutes.